Pro-5 Weed Barrier is the industry's best 5 oz. 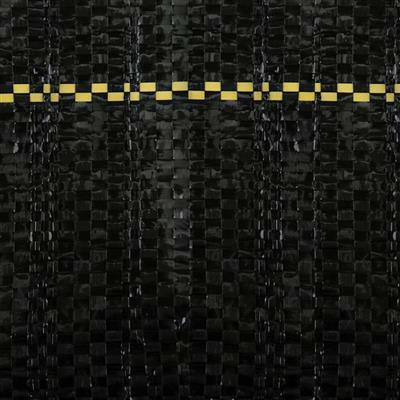 woven, needle punched, polypropylene fabric designed for professional and commercial use. Pro-5 has been approved by leading landscape architects and government agencies. Pro-5 conserves soil moisture, increases plant growth, and prevents unwanted weeds from germinating. 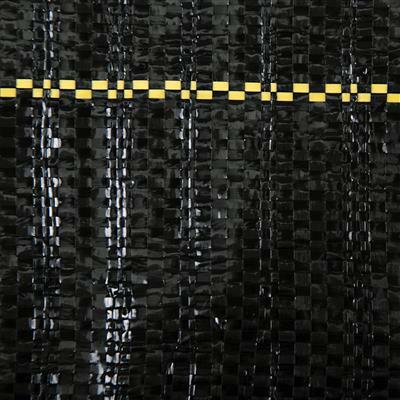 Gold stripes located 12 inches apart make for easy plant alignment. love it. it's nice and heavy and is holding up great. Very pleased. Product was east to handle, yet seemed to be better product than other weed barrier products I have used. I visited a commercial nursery recently and saw the same product used as the floor in a greenhouse. I think I am going to be very pleased with this purchase. We lined our winter frames with this product. Very sturdy and easy to use. 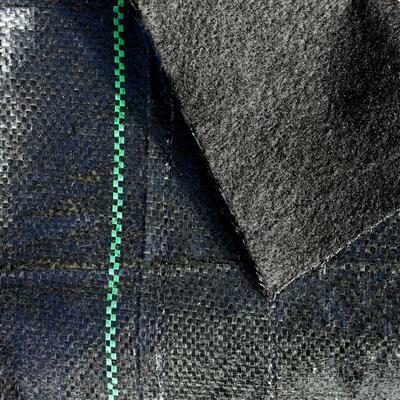 Very good tough weed block fabric: doesn't tear easily & takes years to break down. I have it lining my catio so my cats won't get ticks from weeds or grass. As I have just started using the product to line a dry stream, I cannot at this point comment on its durability. What I can do is say that it arrived promptly and the quality looks good. This weed barrier is great, been using it for 3 years and still works. Disappointed on the thickness of the material. I hope it will withstand heavy foot traffic. It unrolled nicely. Shipping was fast. This is the only weed cloth I use in my gardens and landscaping. I have never replaced them in 40 years. Thick and well made. Love it. Easy to lay down. I just hope it will last up to 20 years like the claim. Based on reviews I bought 2 rolls of this weed block. After 1 week we had lots of sedge growing through. Not happy that I not only have lots of weeds poking through but I've spent hundreds of $$ in weed block that does not work along with many hours of work to lay and cover with mulch. Would not buy again. I haven't had it in long, but so far it looks great and was easy to put down. Will be buying more. I have ordered this 5oz weed barrier before. I wanted to use the best possible protection from weeds I could find for my drought tolerant xeriscape. I had noticed that a lot of other products seemed inferior.We removed all grass and heavily stapled down the weed barrier. Still clover seems to come thru in places. I never remembered even having clover before! Anyhow no weeds other than clover and very few grass blades have ever come thru. The clover is a problem though.You have to cut the weed barrier to plant and even though we stapled it down again.... hello clover! I used this for a huge area which I then covered with barkdust, it laid out nicely, and was easily fastened down with the metal anchors. Only thing I found interesting was the different colors of thread on the edges, as I had purchased exactly the same thing several times, and my understanding was that the color denoted the thickness, and longevity of the material. This is, by far, the best weed control fabric I have used. It's thick, durable and has a 25 year guarantee! The price is right as well. I definitely recommend it! I use in my orchard to prevent weeds. It is easy to install and is of a much higher quality than what Costco carries. I used the 8' rolls of the 20yr PRO-5 for my landscaping areas which are also covered by fine shredded rubber mulch. I have not seen any weed activity but centerpiece grass has no problems growing under and through this material . Infact it seems to thrive . Now instead of picking weeds I spend my time pulling shoots of grass which are growing through this material, it has even grown through where I had two layers. If you have St Augustine grass and you are thinking of using this material then save your money since there is no stopping it. For normal weed growth it has been great. Quick delivery, excellent price, and this product (12 ft x 250 ft)was just what we needed for weed suppression on our 3000 square ft patch of ground. Works great, easy to pin into place! Diminishes weeds the easy way. this is by far the best landscape fabric I have ever used. it's extremely strong and holds up to moving and re-placement. We ordered this weed barrier online and received it in less than 1 week. It is very thick and is holding up well. it for. We laid several tons of 1 rock in our front yard and this barrier never ripped. So far it's keeping the weeds out. We're very happy with this product and feel it was money well spent. Not that expensive considering what they want for a roll of thin barrier at home improvement stores. This is probably the best weed block fabric on the market. I use it between the rows in my vegetable garden to cut down on weeding time. This product will last for years to come. As a professional landscaper I can honestly say this product is the best you will find. Very pleased with this product. I've bought the best at Lowe's and there's no comparison.At least 10x's better than anything I've ever purchased. This had dozens of weeds growing through it within less than a month. I would NEVER buy it again! This is great stuff. It's the same product my landscaper uses. I am using this as a weed barrier under my raised garden beds. It's easy to put down and does not tear like the fabric stuff I bought before from the big box store. I am pleased with the Dewitt stuff and it shipped quickly. I've purchased 4 rolls of the ground cover fabric. 3 of the 4 rolls were great, the 4th was defective. I was unable to return the roll, and have used it for short term coverage. I recommend using the product but ONLY if you can be assured that you've gotten a good roll. I researched long and hard to find a landscape fabric that I felt sure would keep the weeds from coming back. This fabric is very strong and was worth the extra money. I would definitely recommend this product. Fabric is very heavy duty and should provide many years of use. Laid it underneath 3 of rock and had no trouble with installation. Heavier then anything else I have used. product arrived in a timely fashion. Thanks! 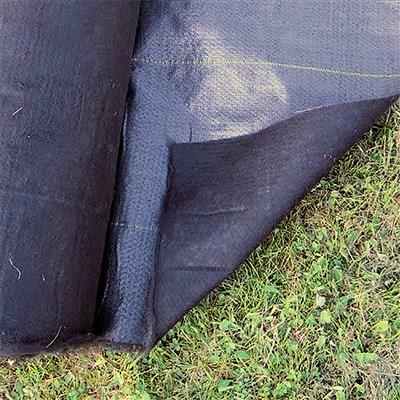 The weed barrier fabric is heavy and tough yet, allows water through. So far it is performing as advertised. I have just put it down this year, so time will be the final factor (for the 5 star rating). Durable and does the job. We had a professional landscape company landscape our back yard and use what they said was the highest quality weed mat available. We decided to do the front yard ourselves and ordered the DeWitt mat. 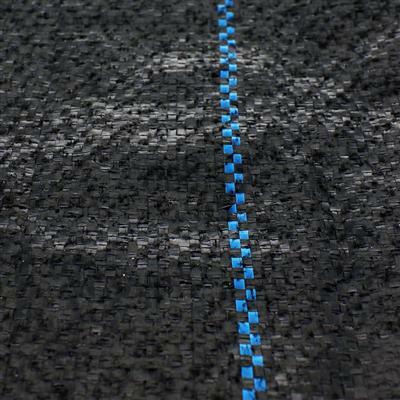 Customer service was very helpful and suggested we buy this quality of mat.Much higher quality than the pros. It shipped on time and we were pleasantly surprised when it arrived. Definately 5 stars! Excellent, easy to cut and handle was delivered on time. I have ordered this product 3 times. Twice the product was perfect, did what I wanted and has provided excellent service. 1 time the product delivered was of poor quality. It disintegrated almost immediately. Was unable to return leftover product. Still have it in my storage area as it is difficult to dispose of properly here in California. While I like the product when it is as specified, if you have concerns I would not buy it online because you cannot touch the material before purchase. Take it for what it's worth, it's a great product if you get the quality you order. This barrier is very easy to install and it stays in place to during the installation process. Even after 2 years on my initial project, it is protecting against weeds and root shoots..
High quality, professional style weed barrier. Works great. i had ordered a similiar product last year and it is already deteriorating with some holes in it where weeds are growing through. i use it between rows of permanent crops such as blueberries. i ordered this heavy duty cover hoping it will hold up longer. we laid it all down and time will tell how long it will hold up for the money spent for this product. thanks.. I bought this to cover a 50x50 portion of my field to grow lavender. I purchased the 12x250 folded fabric. I would recommend this as it was easy for FedEx and myself to handle. 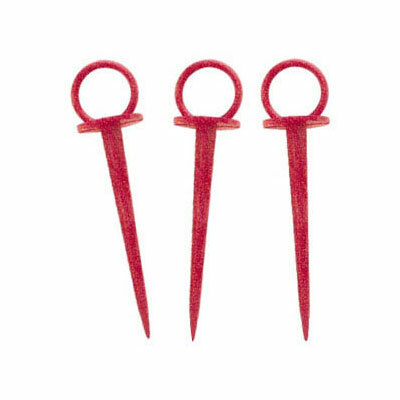 It cut easily with fabric shears, was in excellent condition and easy to use. 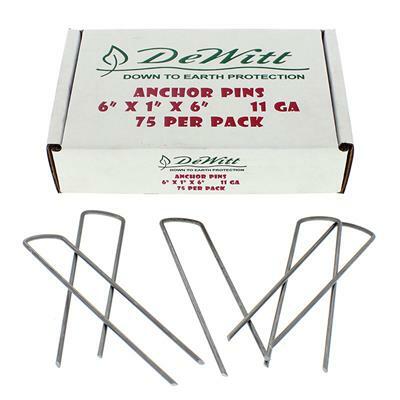 You MUST order the anchor pins along with this. I did not and in a pinch went to Home Depot. The HD pins tended to bend, were hard to use and were 2 shorter than what I could have gotten here. if I could have waited for delivery, I would have, based on other reviewers. This fabric is great. I overlapped seams by a foot for weed control and the markings made this easy. First time buyer here and I am satisfied. The material is doing fine, but really, an honest review should be done AFTER a year or more has passed. Get real. Top quality and great price! Excellent quality. A few years will tell if it is worth the price. This product is heavier than I expected, which gives me confidence that it will prevent weeds from taking root. 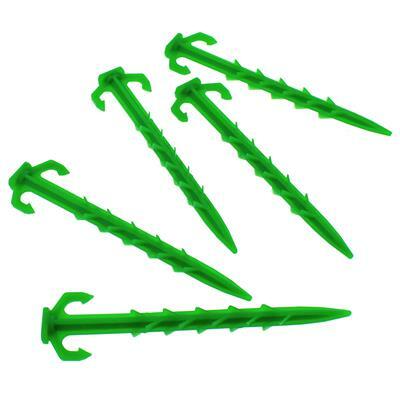 It cuts easily with shears and the pins go through it easily. I like it. Very hearty stuff and worth the price. I hope it will hold up in the intense AZ sun, but have faith that it will outdo the wimpy cloth that is available at Home Depot. Easy to install. It is very thick material. I can't imagine anything growing through it. 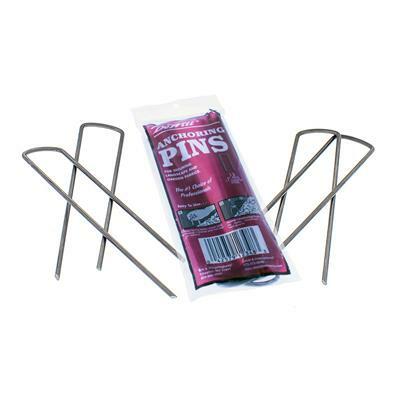 I have used It for inbetween the rows in my veggie garden rows. It is holding up very well to the traffic. Nice product, fair price, quick shipping...very pleased...will be shopping here again. Much heavier than other weed barriers that I've tried. This is my second 250' roll. I use it in many vegetable garden applications. I cut slits and plant onions; cut cross slits for tomatoes, peppers,etc. ; I space two rows of material 1 apart and plant vine crops. Super material. Haven't had to replace any yet in this the third year. GREAT PRODUCT USED FOR SEVERAL YEARS IN LANDSCAPE. WON'T USE ANYTHING ELES. Early review: Product is like a triple heavy landscape fabric; can't see thru it like normal, cheaper fabric. Just placed down in garden, can walk on it without tearing. Not going to cover it with any mulch since its in the garden. Like the yellow lines for plant spacing. The Dewitt Pro 5 is excellent, you won't ever need to replace it in your life from what I can tell. It's heavy, it's quality and its deserving of 5 stars. It exceeded my expectations. This is a truly smart product. It's well made and easy to use. Be sure to keep the fuzzy side down as there is no instruction on that. The lines in the product helped with the installation. This beats sliced bread in my book even though it is a little pricey! I love that it breathes and lets the water go through. I am using it in my veggie gardens (huge ones) and it has made the job of weeding manageable - just the rows in between the cover and a tiny bit around each plant. Next year the whole garden gets it. Don't leave dirt on top of the cover because then weeds can get a hold through the top of it - I sweep it off with a broom. This is the best weed barrier I've ever purchased. It does what its supposed to. The company I originally purchased the product from stop selling it because their contractors were willing to accept a cheaper quality weed barrier. They tried (in a heavy handed way) to get me to accept the same as everyone else, but I would have no part in that. I was grateful to have found the best here at Greenhouse Megastores and will continue to purchase top quality merchandise from this vendor in the future. The price is totally worth it and I received the product within 3 days, even though it had to come via freight. If quality is important to you, then you've come to the right place. Good, heavy quality. I am using it to keep weeds out of my vegetable garden, including my onion beds. on Feb. 2, 2010 i purchased my second order for the dewitt pro-5 weed barrier.. it is so easy to use, and most of all does the job of keeping the weeds out.. best i have ever used and the price is right!!!!!!!!!!!!!! 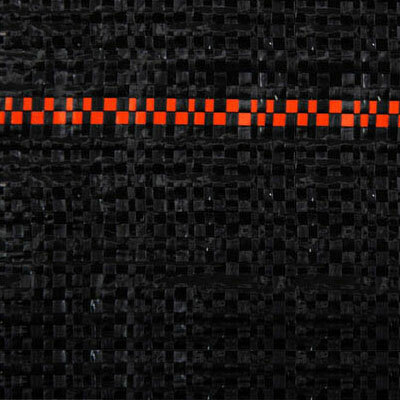 We use this fabric to totally eliminate weeding in are large vegetable garden. We take it up every fall and replace it in the spring. Needed something that weeds couldn't penetrate in the greenhouse. The soil was treated prior to the laying the fabric and NO weeds came through. We purchased several hundred feet of the Pro-5 weed barrier to use between new raised beds. This was after buying weed barrier from other places that claimed to be tough. The others you could tear with your hands or light passed through them allowing weeds beneath them. This Dewitt weed barrier is far superior to any others we tried. It is substantial in weight. We have covered it with rock dust and it is doing a great job. We asked the salesman for the toughest most durable product and he recommended this. It was nice to find that it lived up to what we were told.